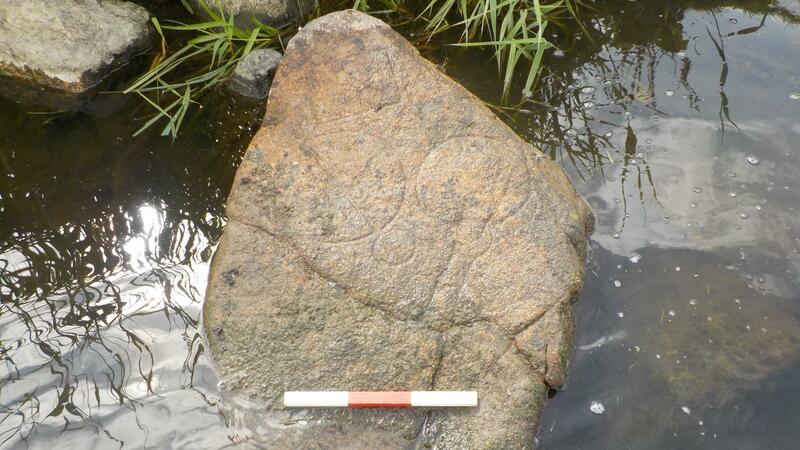 A rare stone carved with Pictish symbols has been discovered in the River Don in Dyce, Aberdeen, thanks to an extended period of unseasonable heat and a keen-eyed local fisherman. The hot, dry weather this summer dropped the water level of the Don to the lowest it has been in decades, exposing the stone on the bank of the river. A fisherman spotted it and reported the find to Aberdeen University. Archaeologists examined the stone and identified it as a Class I Pictish symbol stone, an unworked stone dating to 6th to 8th century A.D. with multiple symbols carved into the surface, among them a triple disc with cross bar, a mirror, and a notched rectangle with two internal spirals. With the water levels expected to rise again soon, the clock was ticking on recovering the stone for further study, conservation and display. 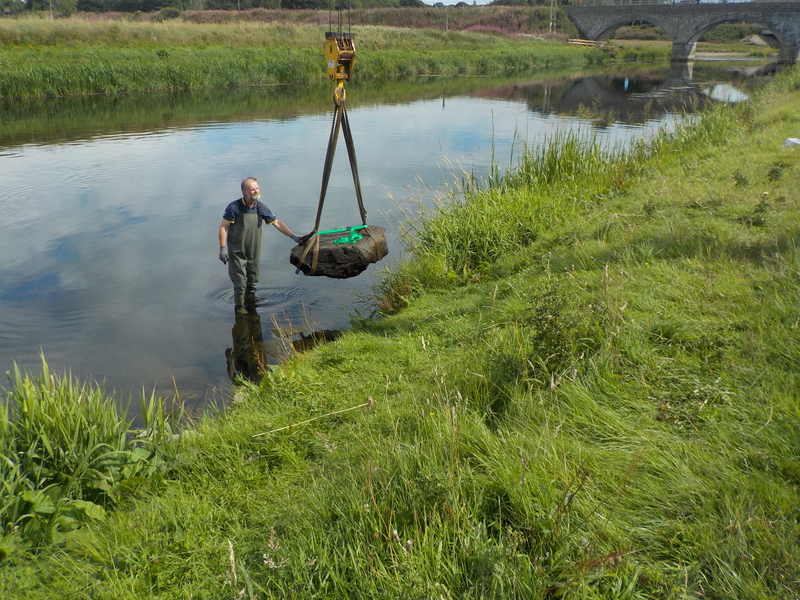 Experts from Historic Environment Scotland (HES), the Aberdeenshire Council and University of Aberdeen worked with contractors AOC Archaeology and a specialist lifting firm to raise the heavy stone out of the river. The logistical challenge was significant because the weight of the symbol stone required a crane to lift it safely, but the crane would have to be perched on the riverbank which is less than ideal a platform for heavy machinery. A mobile crane did the trick, however, and the ancient stone was successfully pulled form the Don without suffering any damage. The stone has been transported to Edinburgh for the time being. Its final disposition has yet ot be determined. This entry was posted on Friday, August 24th, 2018 at 10:06 PM	and is filed under Ancient. You can follow any responses to this entry through the RSS 2.0 feed. You can skip to the end and leave a response. Pinging is currently not allowed. What would -let’s say- a Class III Pictish symbol stone look like? Is there information available by when and how they were made Catholic? In other words: Could the stone have been ‘desacrated’ (i.e. with an ‘a’ instead of ‘e’), ordinarily just ‘thrown away’ or -in contrast to that- maybe even ‘sacrifi(c)ed’? I was once on a dig further north and on our last day we were tasked with excavating a small cairn at the edge of a very complex and interesting building, bitterly disappointed to find it was just a wee clearance cairn from after the building had fallen out of use. I see it is not far from a river crossing, so I wonder if they stone and crossing are related?